A worldly globe-trotter, Faber was born in Moscow, worked as a journalist for what she called a “proper paper,” and, after a trip to South Africa in 2009, has resided there since. In the summer of 2015, she set to traverse what was once America’s main artery from Los Angeles to Chicago by bicycle. “I’m Russian, so I was growing up in the Soviet Union, when all this pop culture was prohibited,” she said. “So whatever information we could get about music or whatever was illegal, but of course we got a little bit of it. I’ve always been interested in the golden age of American culture, which to me, is Route 66, so I was curious to see how it now is, and if still existed. Faber has a wry rationale for choosing to bike her way across the country rather than cruisin’ USA via motor vehicle, to say the least. So does Faber have an 80-mph bicycle prototype, something of which the world has never seen? 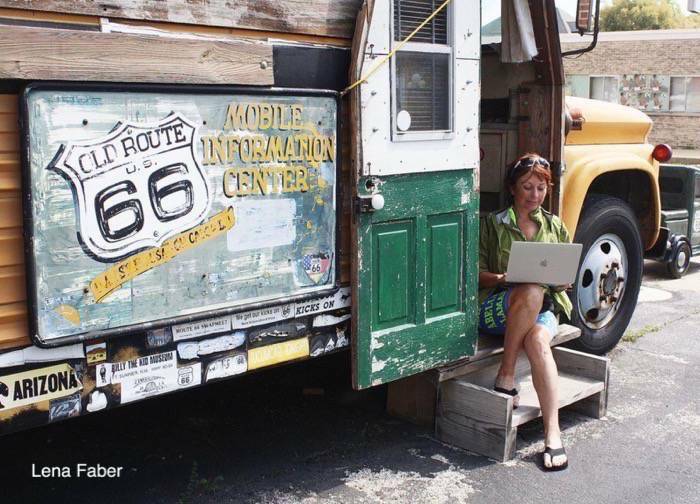 While Route 66 has attracted many cyclists and wayfarers, Faber believes that the ridiculousness of her journey warranted her writing a screenplay about them. Such involved her getting bitten by a dog in Oklahoma, investigating the dog’s drug-dealer owner, aided by a woman she’d met, whom she referred to as a frequently fainting version of Bette Midler. “It’s so ridiculous, it’s hard to even describe,” she said, laughing. While in Pontiac two years ago, Faber got caught in a two-day rainstorm. Brad Trainor, owner of the Old Log Cabin, was kind enough to offer her a place to stay. But in her time in the city, she found its fascination with Route 66 rivaled her own, and the people nothing but friendly, citing it as one of her favorite stops. Faber said that the synopsis of her script is finished, with a couple of scenes already penned as it remains a work-in-progress. She’ll remain in the area for a while yet, and hopes residents come out and join her at the Old Log Cabin for a slide show presentation of her journey on July 25 at 5:30 p.m.